I have commenced the reassuring journey of reading The Road. It is a bitter book but lovely... it tells the story of a father and son travelling through burned America, with only each other to maintain company and warmth. The story wears the livery of a classic old-American tale. It is not a book to read cursorily. 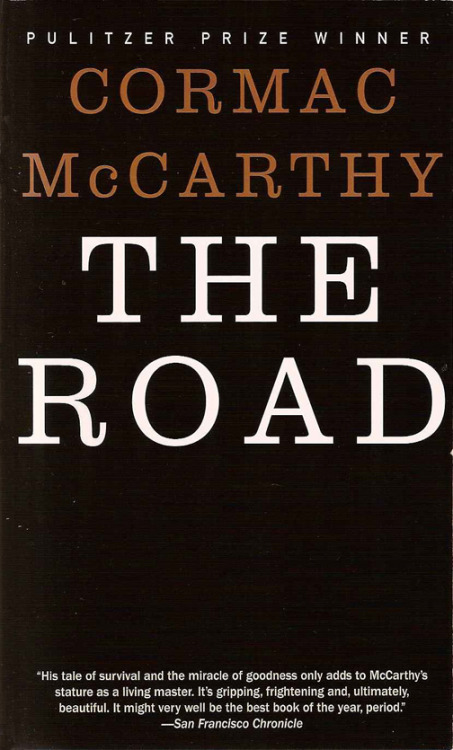 Its language is stunningly truthful; the love McCarthy has spun into each lyrical passage is palpable: the words flow like liquid poetry. The writing style resembles Faulkner (but nowhere near as complicated, blessedly). I cannot quench my inexorable need to finish this book: it possesses, like in a capsule, the bedrock of nostalgic sentiments. It's snowing, the boy said. He looked at the sky. A single gray flake sifting down. He caught it in his hand and watched it expire there like the last host of christendom. He thought if he lived long enough the world at last would be lost. Like the dying world the newly blind inhabit, all of it slowly fading from memory.